With so many new and promising strategies and recent developments, the opportunities to produce and enable high-impact cancer research are unprecedented. Recent advances continue to expand and reshape our views of the essential features of cancer. We are learning important new aspects of how cancers develop, how to find and diagnose cancers earlier, how to design and unleash powerful new anti-cancer therapies, how to evaluate cancer risk and even how to prevent tumors from arising. These advances are delivering useful, productive changes that lead to better cancer outcomes. High-Impact Cancer Research (HICR) is the acclaimed Harvard Medical School postgraduate certificate program for cancer research. It teaches the principles and skills shaping today’s most important cancer research activities. The program’s blended-learning approach is designed with the clinician’s busy scheduled in mind. 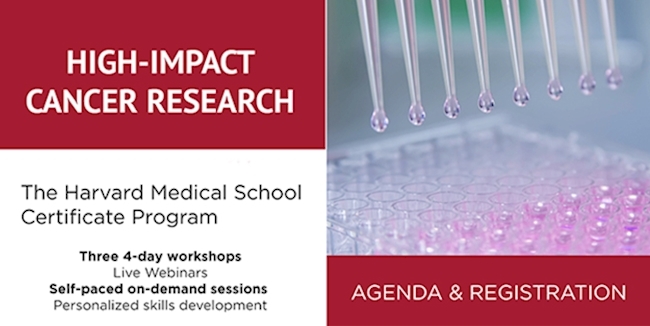 It combines workshops, live webinars and self-paced online lectures from world-renowned faculty and distinguished leading experts who have achieved breakthroughs in fields from discovery biology to therapeutics and prevention.